marksills | Sharing thoughts about becoming a more equitable and inclusive society. Sharing thoughts about becoming a more equitable and inclusive society. We wait for the coming of G-d once again, who came in the form of our brother. He told us, his kin, to “await my return” to just wait with deep faith and assurance. We are, it is said, originally made in the semblance of G-d the Creator. The Bible, if true, says that we are not one, but both female and male in our essence. So now we are waiting for G-d once again, as She comes in the form of our sister. She too will reveal our Great G-d in the flesh; She will teach us to know our true nature. Come Holy Spirit, Mother of Life and join in our search for redemption! Come Holy Spirit, Mother of Hope restore a new trust deep within us! Come Holy Spirit, Mother of Love that we may confront our true nature! Come Holy Spirit, Mother of Faith and give us Your Child, our sweet sister! Until we have met her, and known her sweet grace, we’ll search every face we encounter, in trust that this child of Sophia as well will be able to grant us salvation. We have no illusion, her way will be hard. Her call will be much like her Brother’s. Her touch, just like his, will give sight to the blind; though so many prefer to have darkness. Come Holy Spirit, Mother of Life, and join in our search for redemption! Come Holy Spirit, Mother of Hope, restore a new trust deep within us! Come Holy Spirit, Mother of Love, that we may confront our true nature! Come Holy Spirit, Mother of Faith, and give us Your child, our sweet sister! Her gaze and her touch will stir fires long gone cold in ways that her brother’s could never. Her words and her wisdom will bring peace and joy, but the Servants of Fear will destroy her. We know, though, one day we will meet her and then, she’ll show us the full love of G-d. She’ll welcome us into her ample embrace, all while banishing fear, hate, and anger. 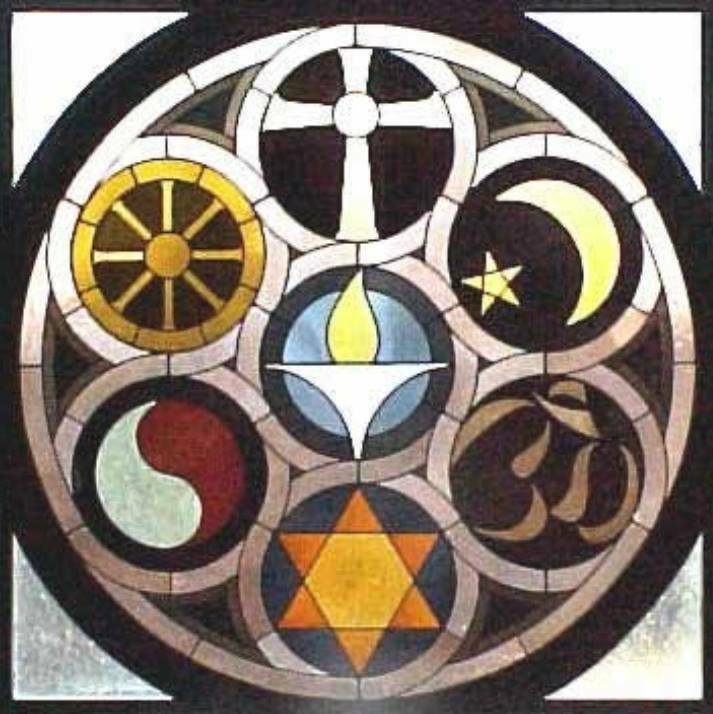 First Lutheran will partner with the Piedmont Interfaith Council to co-host a celebration of World Religion Day on Sunday, January 18th, at 3 pm in First Lutheran’s contemporary worship space, located at 3600 W. Friendly Avenue in Greensboro. Special guests will include the Triad Tapestry Children’s Chorus; the One Human Family choir; and Jewish storyteller, Scott Davis. We will also commemorate the upcoming 50th anniversary of the Selma-to-Montgomery civil rights march of 1965, and we’ll wrap up with a song of peace and a service project in the First Lutheran Community Center, packing snack bags for the Out of the Garden Project from 4-4:30pm. Admission to this family-friendly celebration is free, and all are invited. We hope you will attend this meaningful and uplifting event, but even if you cannot attend, we invite you to bring items to donate to the service project. quart-sized Ziploc bags in which to pack these items. Bring your snack donations to the celebration or (if you wish to drop them off ahead of time) to Frank Moore’s office at the church, frank@firstlutheran.com , and take your questions to Melissa Burris, who can be reached at melissa.burris@firstlutheran.com or 292-9125. Like most all of you, I was bombarded with requests for end-of-year donations to charities. TV was filled with ads for Wounded Warrior Project and other large charities. The ads are compelling. But, I did my research. Most of these big charities only manage to pass around 10% of their funds to actually benefit any person in need. The rest is consumed by large executive salaries, operating costs and fund raising costs. If you want your charitable giving to really have an impact on people in need, give locally. Give to the organizations in your community that directly serve those in need. Please don’t waste your giving on outrageous executive salaries and overhead. Buy local – give local. For many thousand years, people around the world realized that during the autumn days got shorter and nights grew longer. But they also realized that at a certain point, this trend would change and once again the days would become longer and the cold would gradually be replaced with warmth. And so, they began to celebrate what they called in one way or another “the return of the Sun” around the time of the Winter Solstice. Today, the Winter Solstice is still celebrated by people all over the Northern Hemisphere. We all rejoice in the knowledge that the long darkness is going to be replaced by longer times of light and the cold of winter soon will be replaced with the warmth and beauty of spring. People in many different countries who are part of different religious traditions have all created special celebrations of light and warmth. When Christian culture began to spread in many parts of the world, this new religion did not have any major holy days to celebrate. Christians saw all the others around them having a great time decorating and giving gifts in celebration of the returning sun, and they decided this would be a good time to celebrate the birth of Jesus. To Christians, Jesus was often called the “Light that has come into the darkness.” So it made sense to them that while everyone else had a celebration of light, they could too. In Rome, December 25th was celebrated as the birthday of the Sun and it was the largest and most joyous holiday of them all. So, about 350 years after Jesus died, Christians in Rome began to celebrate the birth of Jesus on December 25th making this already special day special for them as well. At first, it was just those Christians who lived in Rome who celebrated Christmas. In time, however, the joy of this season became a major celebration for Christians in all parts of the world. For our ancestors going back many generations, and for our family today the celebration of the Winter Solstice includes a remembrance of the birth of Jesus. We fill our homes with candles and lots of colorful lights, with decorations of all kinds and especially brightly lighted Christmas trees, and we celebrate the fact that no matter how dark the world may be, even a tiny little light can make the darkness go away. And even though we know Jesus was really not born this time of year, we always share the story of the birth of Jesus when we gather for this very special holy time. Joseph and Mary arrived in Bethlehem during a time of feasting and celebration in the Jewish culture. It was a very busy time in Bethlehem. Also, the Bible tells us the reason that Joseph traveled to Bethlehem was due to Roman Emperor Caesar’s tax registration and so the town was probably filled with folks even more than usual. Careful reading of the Bible in light of the cultural norms of that day shows that at least a few days before Mary gave birth, she and Joseph were taken in by one of the local homes, most likely that of a close relative. The host family likely already had guests in their upstairs room, so there was no space for them there. So, the homeowners graciously made room for Joseph and Mary in their own living quarters. They kind of doubled up just like we do when lots of family members come to visit. When Mary went into labor, the men would have left to give her privacy, and the women of the household would have come to Mary’s side for help and support. Shortly after Mary gave birth to Jesus, late in the evening, Joseph and the men would have been called back into the house to see the new baby boy, and there would have been a big party, which was always a traditional part of the birth of a baby boy, particularly if it was a first child like Jesus was. Not too long after Jesus was born, he was wrapped in swaddling clothes, dedicated to God, and placed in a manger in the family home, which would have been cleaned and made up with fresh straw. Remember, in those days, families kept their animals inside their homes at night to protect them from robbers and wolves. Today the birth of Jesus is usually shown with the baby in a stable, but it is more likely that he was born right inside the home of a relative. No doubt the news soon spread around the village that a baby boy had been born (the music and shouting during the party would have helped that happen), and that both the mother and baby were doing well. Soon, however, there was to be news of a different kind. Shepherds showed up from a nearby field and told the village that a great light had shined around them. They said an angel (which means “messenger”) had told them that this baby was no ordinary baby, but the Messiah, the one who was going to save the Jews from the Roman occupation of their country. Their report caused great wonder all over the region, and everyone sang songs of glory and praise to God for this new baby. Of course, word of this reached the ears of the rulers, and they were very upset. They decided to kill the baby in hopes that they could maintain their power and control over the country. And so, Joseph, Mary and their baby boy were forced to flee from their native country and cross into Egypt as refugees in order to survive. The story of the birth of Jesus reveals much that demonstrates the true spirit of Christmas: people opening their homes and their hearts, joyfully giving to others in need, welcoming others into their homes, and helping others wherever they can. And just like when Jesus was born, even today we all like to get together with our family and share good food, tell stories, and give gifts to one another. We also take food and gifts to the homeless, and to elderly people in nursing homes, and to others who are in need in our community. We take special care to welcome the immigrants and refugees who have had to leave their homes and countries in search of safety and security. And, of course, we love fill our homes with beautiful, colorful lights to remind us that sometimes, when things seem really dark, and headlines in the news make it look like it’s only going to get darker, just when it seems the darkness is going to take over the world, the light starts to return. That is something worth celebrating. Note: the following progression is based on statements I have heard made by otherwise sensible people. I feel strongly that human beings are inherently spiritual beings as well as physical beings. We have an innate need for a connection with Deity. The problem comes from the way we begin to “own” our beliefs and denigrate the beliefs of others. It begins simply enough with the thought that “God is good.” Totally harmless. But then, the personal “ownership” of God takes hold and it becomes “my” God is good. On and on the progression goes, and this God that once was just “good” and “love” becomes a demanding, punishing, hateful God who justifies the destruction of those who refuse to worship in a certain way. Follow the sequence, and remember, I have in the past few years heard otherwise decent people say each of the things listed in this progression below that moves from a God of love to a God of hate. This kind of progression can, and does take place in every faith tradition. It is not something that can be attributed to just one faith. Becomes….My God is good. God loves me. Becomes….My God is the God of all gods. God loves me. Becomes….My God is the real God. Your god is false. My God loves me. My God loves you too, but not as much. Becomes….It would be good if others worshiped my God because my God is real. It would be easier to love everyone if everyone worshiped my God. Most of the problems in the world result from people not worshiping my God. Becomes….It is important for me to convert others to the worship of my God because they will be lost if they continue to worship false gods. My God loves me and punishes those who don’t agree with me. All the problems in the world come from people who worship false gods. Becomes….Everyone must come to worship my God because my God is the only real God. God loves me and hates those who disagree. It is my responsibility to make sure that people who worship false gods convert to worship my God. If they don’t, the problems of the world will get worse and worse. Becomes….It is urgent that those who worship false gods be converted, by any means necessary. If they don’t convert they don’t deserve to live. This world belongs to those who worship the one true God. God loves me. Anyone who disagrees deserves to die. Becomes….Because there is only one true God (my God) there is only one true religion (my religion). Anyone who deviates from the pure practice of the one true religion must be destroyed and all that they have done throughout history wiped out of the memory of those who keep the one true religion so they may remain pure (like me). Becomes….God is good (like me and those like me). God is love (for me and those like me). Ultimately, of course, this is the idolatry of the self, and a total denial of Deity. Since childhood I have been attracted to the spiritual dimension of life, yet I seemed to have no choice but to question the dogmas and narrowness of so many aspects of organized religion. 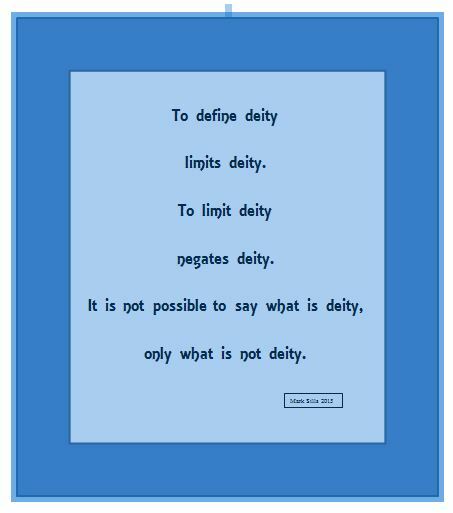 In particular, I have never been able to limit the scope of Deity to just one set of religious teachings, to one little slice of “truth,” and more especially to just one religion. Now in my retirement, I have been using some of my time to research my family genealogy. Doing this seriously, insisting at every stage on having more than one primary document to verify information and not relying on stories or reports that cannot be verified has been a demanding and tedious process. But it has been rewarding. I have discovered, for instance, that I am descended from a long line of folk who took their faith very seriously, but who also resisted being forced into an orthodoxy that conflicted with their own understanding of spiritual truth. For example, many of my colonial ancestors were Quakers who were among the first English settlers in Jamestown Colony. They left England due to religious persecution and became successful farmers in Virginia. However, from the beginning of the slave trade they not only resisted owning slaves, they actively opposed the practice, causing them great difficulty in their communities. Some of my ancestors came to the New World from Germany, having migrated there from Switzerland where they were active leaders in the early Protestant movement. They took their faith seriously and over several generations were forced to leave all they had behind to flee persecution. Perhaps there is some genetic memory that has come down to me that has caused me since my teen years to strongly oppose any religious teaching that oppresses or condemns those who hold differing views. One of my best known ancestors, my 11th Great Grandmother, was Anne Marbury Hutchinson. Anne was born in Alford, Lincolnshire, England in 1591. She was baptized at the parish church in Alford on July 20, 1591. Her parents were Francis Marbury and Bridget Dryden. She was 21 when she married William Hutchinson at St. Mary Woolnoth in London on August 9, 1612. Anne was first a mother, giving birth to 15 children altogether, all but two of whom lived to adulthood. She was also an intelligent and strong willed woman, attracted to the study of the Bible and of theology. She and her husband were so enthralled with the Puritan preacher, John Cotton, they quickly followed him to the New World after he fled England due to persecution by the Anglican Church. She arrived in Boston aboard the Griffin in 1634 at the age of 43. While her husband’s business flourished and his civic roles increased, she began to teach Bible classes in her home, a situation quite unusual for a woman in those days. Soon, the classes were filled with both men and women, some coming from distant towns and cities. Because her views were generous to other people of faith (non-Puritans in other words), the Puritan leaders of the colony took offense. Governor John Winthrop, in 1636, began to warn that her views were dangerous to the state, and she must stop her teachings. Anne continued to teach and the crowds attending her classes only grew. Finally, in 1637 a trial was held and she was convicted of heresy. The court banished her from the Colony. She was given three weeks to leave. Because of this, Anne and William, along with a few others, used their wealth and experience to purchase land from the Indians and in 1638 they established a purely secular colony which eventually became Rhode Island. I am proud to be descended from heretics like Anne. I pray that I may continue in old age to question, doubt, and resist any effort by religious authorities to limit Deity and to condemn those whose spiritual experience is different from theirs.